Phool makhana snack recipe - This seasoned phool makhana is a crispy and spicy snack. The lotus seeds or fox nuts are mildly spiced with chilly powder, turmeric powder, salt, etc. The phool makhana itself is bland. It extracts some taste and flavor from the seasoned ingredients. So using proper amount of oil, chilly powder and salt is essential to make the phool makhana tasty. 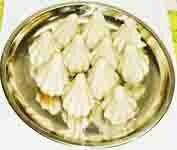 If done properly, tempered phool makhana is a perfect snack with hot tea or coffee. Heat a pan and dry roast the phool makhana till they become crisp. Remove and keep it aside. Heat the oil in the same pan, add the mustard seeds and allow them to splutter. Add curry leaves and saute for 30 seconds. Add the turmeric powder, chilly powder, and salt. Mix well and saute for 30 seconds. Add the roasted phool makhana and mix well. Stir nicely to make evenly coated makhana snack. Remove from the flame. 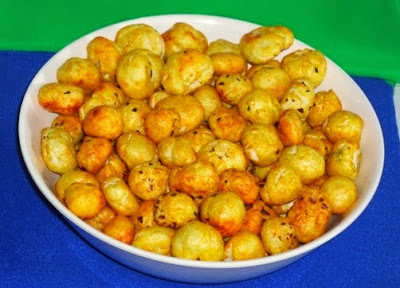 Serve phool makhana snack with a cup of hot tea or coffee. Very healthy snack.. love it! A guilt free snack to munch anytime. Lovely and easy snack recipe..
Been ages since I had Makhana! very healthy and tasty recipe. New to me,thanks for sharing. My favourite any time snack..